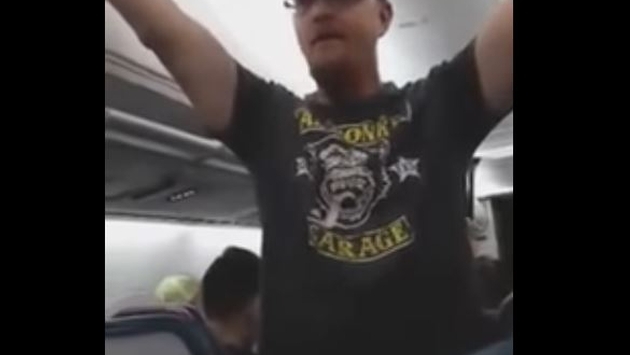 A man delivers a profane rant on a recent Delta Air Lines flight. Days after coming under intense criticism for its handling – or lack thereof – of a profane tirade from a pro-Trump passenger, Delta Air Lines today issued a lifetime ban to the man, prohibiting him from ever flying with the carrier. Delta came under fire over the holiday weekend after a video went viral showing a male passenger standing in the aisle and delivering an almost minute-long pro-Donald Trump rant – while profanely blasting Hillary Clinton supporters. The video was posted by Facebook user Emma Baum, who apparently was on the same Delta flight as the man on Tuesday from Atlanta to Allentown, Pennsylvania. She shared the video with MSNBC and The Daily Beast, and it went viral from there, being picked up by a multitude of media outlets. It has since been seen more than 2 million times. Delta was chastised on social media for not only allowing the man to continue without the crew interrupting him but, after flight attendants initially led him away after his tirade, he was allowed to return to his seat. Bastian acknowledged that, in this day and age, passengers have been removed from flights for far more minor transgressions and that the decision remains a prickly lone.